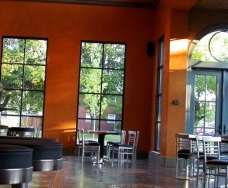 Caffe Dolce features fine dining with informal flare, at everyday price points. We are part of our neighborhood, and our community. We believe in real food, real ingredients, and flavor. Our offerings span from dawn until dark. We bake fresh in the morning, and offer traditional Italian coffee service. We serve a simple but satisfying lunch in the afternoon, and transition to our formal dining service in the evening. Our pasta is homemade, our woodstone pizza oven provides a glorious hearth, and our entrees are seasonal and delicious. We make gelato and great pastries. We love wine and beer, and feature a list that delivers at every price point. Brunch is served all day on Sunday. Seasonal Patio. Kids are welcome.